I’ve known Lesley for about 10 years and have enjoyed her books so much that I have asked her to be my very first guest author, just in time for Halloween. Lesley has appeared on TV specials for the History Channel (“The Haunted History of Halloween”) and Nickelodean. On October 26 of this month, she will appear in another special for the History Channel called “The Real Story of Halloween.” Check out her website at iskullhalloween.com. Okay Les, let’s get right to it. Why Halloween? I have never been shy about being a Halloween nerd. From day one, the freedom of running around in a cape after dark stuck the knife in it for me. As an adult I was drawn to Halloween because it’s interesting on so many levels from metaphysical (yes, the light/dark, all-this-will-pass underpinnings of Halloween) to completely physical (fear science!). And Halloween keeps changing; once it became associated with horror, Halloween opened up to all our modern monsters and trends, which means there’s always something new to think about. I should say the candy, but that would only be partly true. The pumpkin ale is a huge plus for me. Beyond those creature comforts I love the group glee that happens on Halloween. It’s rare to find a big, noisy gang of like-minded people out in the real world (aside from sports events and concerts), and that’s one of the things Halloween does best: create communities based on imagination and fantasy. I love that. How do you decide on a topic for one of your books? Each is different. The history book was one I proposed because I couldn’t find the whole history of Halloween detailed in any of the existing books. Part of the story was missing, and that inspired me to pursue Halloween history in this country. The How To came out of all the really wonderful people I met who were down in their cellars and out in their garages creating amazing things for their displays. The Anthology was the result of me spending a few years in the stacks of Widener Library and the NY Public Library looking for poems, stories, and plays that were less well-known, and the hardest part of that task was trying to keep only to Halloween and not get sidetracked into horror or vampire lit or any of a wealth of dark work. The new one (Halloween Nation) was me trying to figure out what it is about Halloween that excites us so—why now, and what is it really all about? I am a notorious mono-tasker. That means that if I’m writing on zombies, say, I start at the beginning with the research and continue until the section is written. Where I think other writers can collect all manner of research, sort it out, and come back to write it up later, I focus on one thing at a time. It helps me think more clearly, and hopefully, come up with better ideas. And I always write the introductions last: they are the hardest. What kind of research goes into it? Research is everything, almost. It’s the fun part, too. I love reading, scanning libraries and the internet, and talking with people. Writing can be fun, especially when I think I’ve got something good and can get it on paper, but it can also be like pulling teeth. I’d say I write each piece that goes into a book—and by piece I mean section, not chapter—at least ten times. If I compare the first draft and the last, the last is shorter by half. Once I’ve got the final draft it’s a matter of fact-checking, which is not my favorite part of the process, but so incredibly essential. The brain plays funny tricks on writers. What is the wackiest place you’ve had to go to in order to find something out? Well, I do enjoy wacky places, so picking my most memorable is tough. I’d say interviewing a woman in a Mortuary School morgue building was…interesting…as was lying in a fake coffin, dancing at a Samhain ceremony, hanging out with spandex-covered vampires, and riding in the Zombie Army bus. What was your favorite Halloween experience? Can you pick just one? Oh, Pam, I just couldn’t. I will describe one that’s memorable though. In 2001 there was a lot of contention around the Greenwich Village Halloween parade. There were thoughts about whether or not it should happen; some said no, it would make NY a target again, and others said of course, why wouldn’t there be a parade? They decided—I think it was even the morning of Halloween—to stage it, and the parade began with a baby phoenix puppet. The ashes were still smoldering in the background at Ground Zero, and as the phoenix puppet marched, the spectators started to clap and cheer. The parade director, Jeanne Fleming, said it was as if New York could finally breathe again. You did a children’s book also. How did that come about? The publisher, Pelican, has a series of “The Night Before…” books with lots of different takes on the Christmas poem (The Trucker’s Night Before Christmas, The Nurse’s Night Before Christmas). I proposed a “Witches Night Before Christmas” and wrote a poem that turned out to be deemed “too dark” for a Christmas book. (OK, I think they had a point: …Came a driver the likes of whom I’ve never seen / A towering skeletal red-hooded fiend /Dead-eyed and dusty and fearful of none /He’s come to do that which Claus never got done/) They suggested I lighten up and try to pair it with Halloween, and I actually had a ball writing Witches Night Before Halloween. The illustrator, Adrian Tans, did a beautiful job on the images, many of which are paintings. If you do have a little one, tell them there’s a frog to find on every page. You have a new title coming out in April of 2011. Can you tell us about that book? Usually writers like their most recent book best. Guilty! I mentioned why I wrote the book above, but how I wrote it was to travel around talking with Halloween fanatics about why they do what they do and what it means to them. It was probably the most fun I’ve had researching a book, and I loved going “backstage” at Halloween prop-making shops, zombie events, haunted attractions, everything. With very few exceptions, all the folks I spoke with were wonderful and generous. I learned how to make glass pumpkins and how to grow giants, what goes on behind the scenes at the Witches’ Ball and how to spot a ghost with an electromagnetic field meter or at a spirit stump. I can’t remember a bad time in the years I was working on this. Okay, you also mentioned a women’s Brazilian drumming group. Do you want to share any information about that? Ha! Serendipity lined me up with a group of adventurous ladies and the most patient Brazilian drum teacher on the planet. I play the surdo – it’s kind of like a bass drum. We practice once a week and occasionally play out at festivals or clubs. I can’t tell you how much fun it is. At this point, we’re kind of like a flying elephant. It really doesn’t matter how well the elephant flies, you’re just amazed it can. And finally, what do you do on Halloween? I like to be home giving out candy. My house is tricked out, and kids know where to find me. I put on some really great Halloween music, dress up in costume, and keep the fog machine running. Happy Halloween Lesley and thank you so much for this informative and thought provoking interview! Being from New York, the Greenwich Village Parade story really touched me. I love Lesley's books and highly recommend them, whether you are a "Halloween nerd" or not! 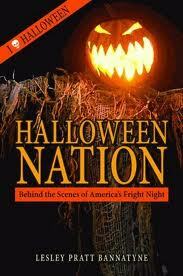 • Halloween: An American Holiday, An American History. (1990). • A Halloween How to. Costumes, Parties, Decorations and Destinations. (2001). • A Halloween Reader. 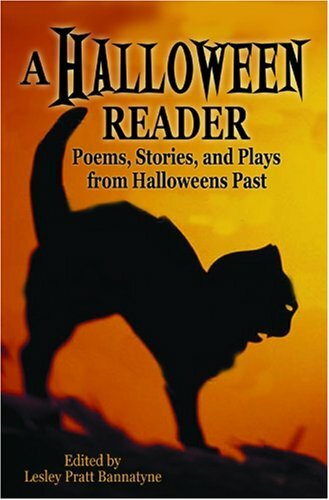 Poems, Stories, and Plays from Halloween Past. (2004). 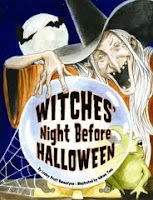 • Witch's Night Before Halloween. (2007). • Halloween Nation. Behind the Scenes of America's Fright Night. (Coming in 2011). This contest will end Tuesday, October 26, 2010 at midnight! Contest extended one more day! This contest will now end Wednesday, October 27, 2010 at midnight! It is open internationally. (As long as vendor ships to your address). It will be shipped the most economical way. I will choose which vendor the book comes from. If you would like a copy of her new book, Halloween Nation, I will pre-order it, but please note that it will not be released until 2011. Please leave me a way to contact you. If I do not hear back from you within 7 days. A new winner will be chosen. If for any reason, the book the winner chooses cannot be obtained, the winner will have to choose another title from this contest. Since I would love to promote Lesley's books as much as possible you can get entries by Tweeting and re-posting. +1 Leave a comment about anything in this interview you found interesting, didn't know or peaked your curiosity. +2 Tweet about contest (please leave link). +2 Mention this contest on your blog (please leave link). +1 Mention this contest on your Facebook account (please leave link). +1 Please remember to add them all up! +5 Tune in Tuesday night 10/26/10 to the History Channel at 8:00 pm EST (check your local listings) and check out The Real Story of Halloween. Leave a comment about something Lesley talked about. Since Lesley pointed out that her interview may not make it into the program (which would be a darn shame), leave a comment about something from any part of the program. But hopefully, we'll all be seeing her in the show! Pam! The new blog looks AMAZING!Great job to you! Thanks...it wasn't me who did it. It was Blogging Bella Designs...see the side bar.